All the Reiki Circle Books to date - there are more on the way! Reiki is more than a healing modality. Reiki goes where it's needed. 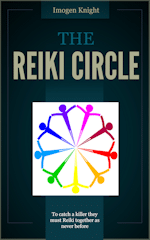 When what's needed is to unmask a killer, Reiki lights the narrow path to Red Heart's lair. A murder mystery with a Reiki twist. Millie Garner was woken in the middle of the night to identify a body with only her name and address as identification. Drawn into the shadowy Red Heart's "game" Millie and her group pour Reiki into the situation and set about solving the mystery of their friend's death with the help of the local police. You'll never feel the same again about accepting some stranger's friend request on social media as you follow the twisted Red Heart's plot to stalk his victim and entice her into his clutches. A satisfyingly evil villain, plenty of twists and a truly shocking insight into the mind of a murderous psychopath, Knight keeps you guessing right to the end.